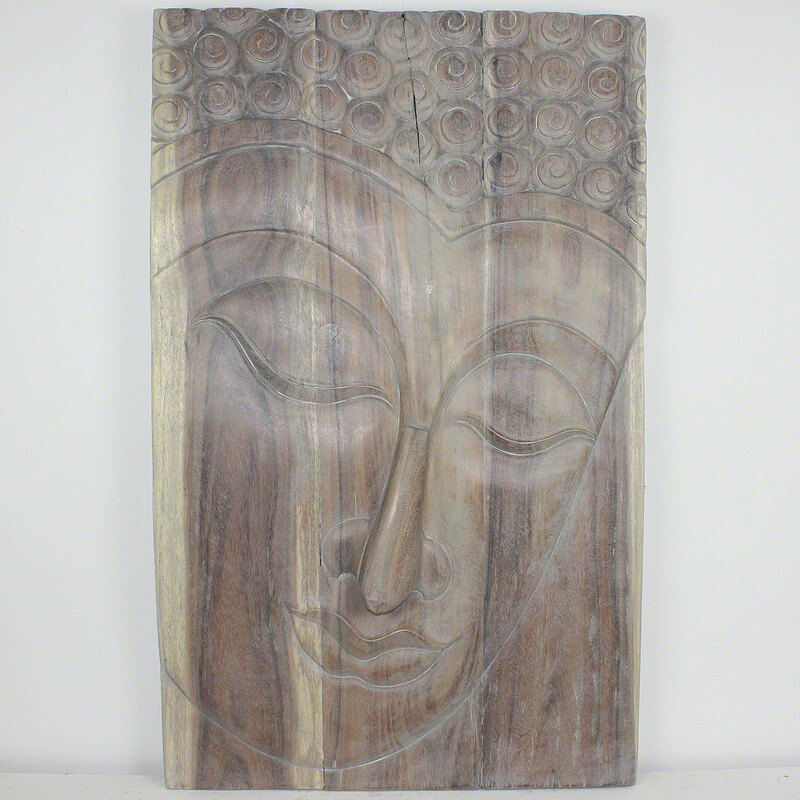 At Natural Wood Decor our goal is to strive for customer satisfaction by providing outstanding customer service along with high quality, unique, functional works of art for the home using sustainable materials and practices. We are committed to providing consistent quality and environmentally friendly products. Our intention is to treat you, our customer, as we ourselves would expect to be treated. We promise to act with integrity in a professional, prompt and pleasant manner with every transaction. All of our wood products have been hand carved and crafted by experienced artisans out of sustainably harvested chunks of wood. 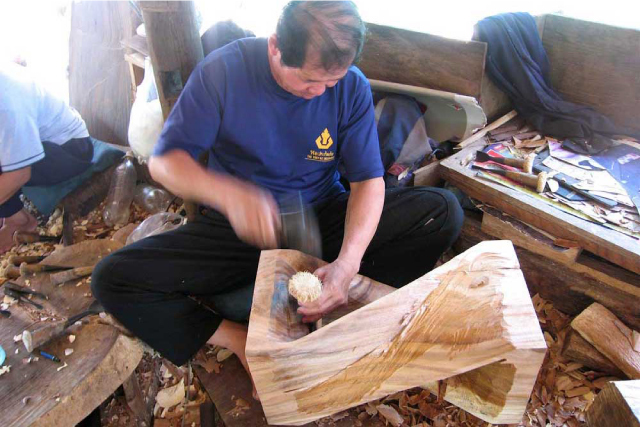 Oftentimes, a carver can study a piece of wood for a significant amount of time before deciding which product is going to best reveal the inner beauty of the tree. 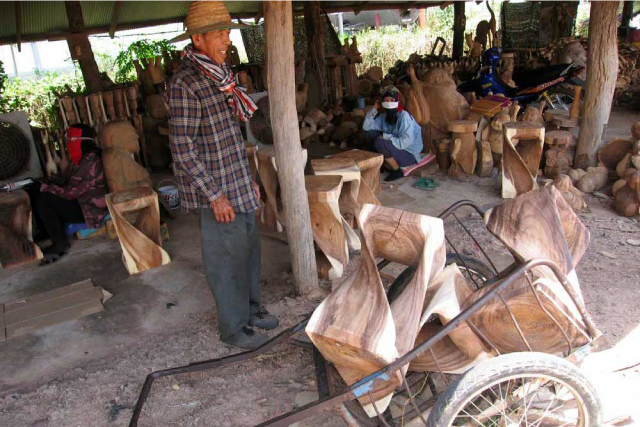 The artisans appreciate each piece after it has been sawed, hand chiseled, hand sanded and stained. We are appreciative of the hard work that goes into each product and are proud to carry these items in our store and offer them to you. Because of the hand-made nature of our natural wood products, there will be some slight variations in color, texture and appearance. Learn more about how each piece is unique below. With a natural and handmade product, our sizes are an approximation but are generally within plus or minus 1/4". We cannot guarantee that products are perfectly square or flat. We do create useable and reasonably flat surfaces while highlighting the natural wood inclusions and hand carved surfaces. We do not fill in or repair carving marks, or natural inclusions like knots and branch growths. Instead we sand to blend them in and assure smooth edges and surfaces that are useable. However, on some products we will use the same wood to fill in old worm holes and such. The color, after finish is applied, will vary from the pictures depicted for every single piece. This is because the oil is the same tone but the color of the underlying wood of the piece it is being applied to varies. For example, Acacia wood (Monkey Pod, Rain Tree), like all woods, has varying tones of browns in the reddish to black ranges depending on its age. The new growth or "white wood" ages from white to yellowish changing to light yellowish browns over time. This change in color of the underlying wood will affect the appearance of each finished product after the oil is applied. Nonetheless, each piece is beautiful and unique. 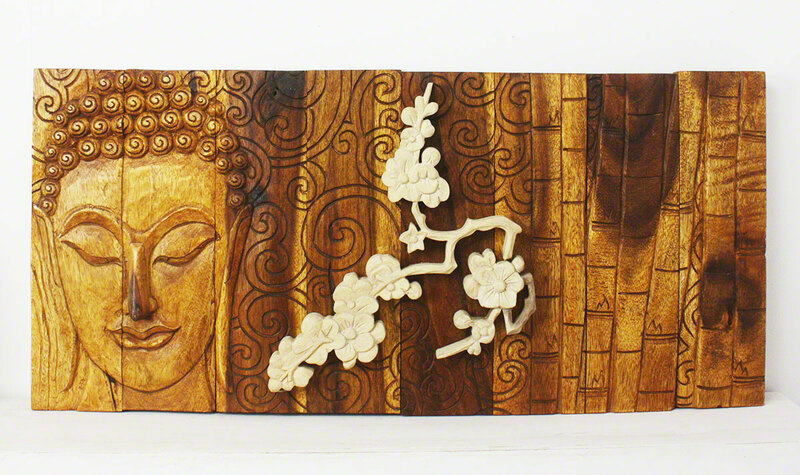 After panels are carved from several pieces, the wood shrinks as it dries. When the panels are placed back together they may not line up exactly as carved. Workers joint and sand to close the gaps and then blend the design as well as possible with hand chisels. There will be some slight variances where two panels join. After hand carving, the rough products are placed in a solar oven over a period of months to bring the moisture content level down. At the end of the drying stage the temperature is raised high enough to help insure there are no wood bug eggs inside the wood. Drying can be difficult as most of our designs have varying wall thickness. After testing the moisture content of every piece, the product is sanded in stages to smooth the rough carving into the final shape. This is all done by hand so every piece is unique, sizes are not exact, but the flat surfaces are made functional. Now that all of the natural and drying cracks, and wood inclusions by rough sanding have been exposed, they are sanded to smooth and blend all surfaces. One group will finish sand the overall product, and then another group will inspect and finish sand any inclusions, cracks, or marks by hand. Applying the oil is a time consuming art. 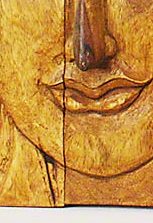 Even though the wood has been sanded smooth, the nature of the wood is to have crosshatched surfaces exposed at times. The oil is rubbed in by hand, in thin coats, in three to six stages over the course of five to seven workdays. The oil has to be allowed to absorb and dry into the wood. This is to build up a surface that can be buffed into a matte finish. The weather affects this process, so there is no set time between coats. Since there are no wood sealers or chemical bases used, occasionally there can be some small dull or rough spots. This is in keeping with the policy of creating an all-natural safe product that can complete the product life cycle. All products can be safely disposed of, if need be, into the earth from which it came. Since our products are handmade, they may have marks from tools used, patches from small repairs, knot holes, natural inclusions, and/or worm holes. There will also be various separations or cracks on your piece when it arrives. These naturally occurred as the wood was dried and shrank. Over time, some continued shrinkage may accentuate existing separations or generate new ones. This does not compromise the structural integrity of the wood and is considered inherent to the natural beauty of the design. The wood is from a tropical climate, and like all wood, is still "alive". It will change some over time based on your climate, and whether you place the piece in direct sunlight, or by a heating or cooling source, like in front of an air vent. Small cracks may appear but this is normal and will stop occurring over time. Simply rub in a natural neutral color wood oil to seal again. Of course, if a major crack develops that threatens the structural integrity of the product; we will gladly exchange it within the first 30 days. Wood is quite possibly the most natural green product you will find to liven up your home. Our sustainable wood products are harvested, carved, sanded, finished and dried using specific environmental standards. 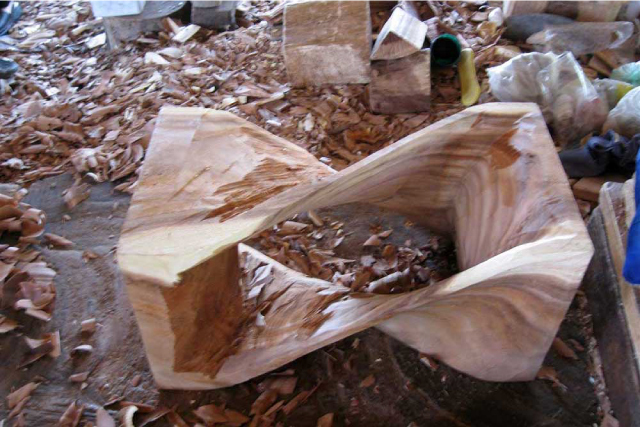 The production process for sustainable wood furniture will wow you with how eco-friendly it is. Sustainable wood furniture is hand made from trees that are abundant and fast growing, and are locally carved and treated. 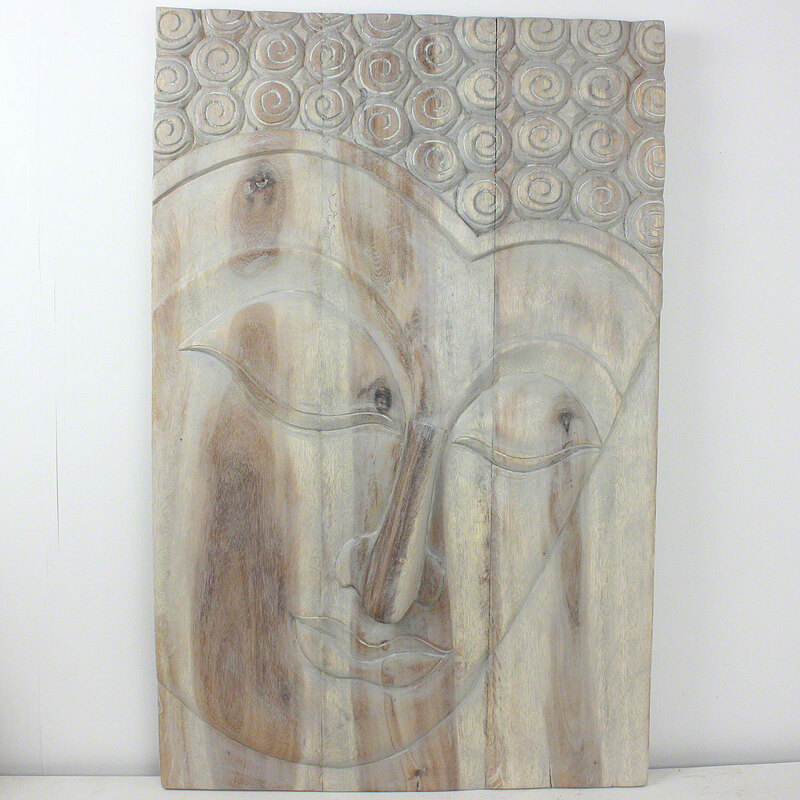 Artisans in Thailand harvest the wood, carve each piece, then put it through rigorous drying and testing processes to ensure that the final product is top quality. Whenever you buy "natural" or "sustainable" products, it's important that you know exactly where the materials come from and how they are made. When you buy our sustainable wood furniture, be assured you're buying something that is truly environmentally friendly and benefits local artisans.